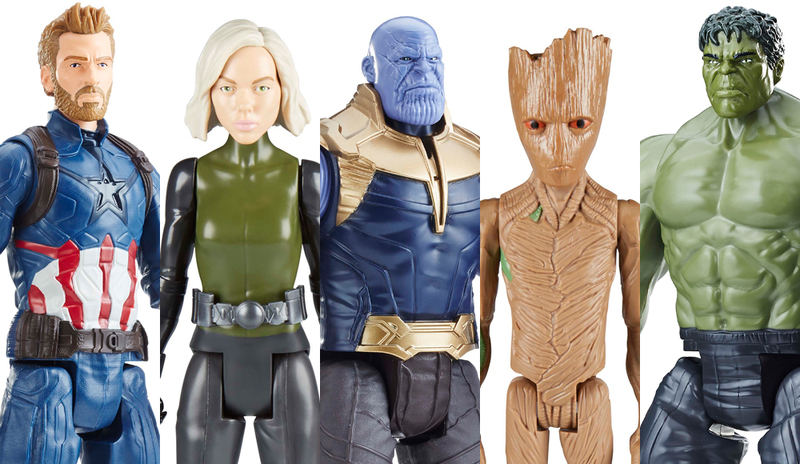 In non-Marvel Legends news, Hasbro has announced their toy and role play lineup for the Infinity War. Needless to say, it’s huge! Honestly this is the kind of roll out the last couple of Force Fridays should have had. Impressive work, and there is a little something for everyone. Check out the official word and pictures from Hasbro below. All of these items should be available to purchase in stores this Saturday (March 3, 2018), so if you are in the market for some new Avengers gear go check your local stores or online. The chase is on for the Infinity Stones in AVENGERS: INFINITY WAR, in theaters May 4th. IRON MAN, CAPTAIN AMERICA, BLACK WIDOW, HULK, and THOR team up with new allies SPIDER-MAN and the GUARDIANS OF THE GALAXY to protect the world from THANOS, the most dangerous foe they have faced yet. HASBRO’s soon-to-be revealed product line will include innovative new platforms of play across role play and figures, launching on March 3rd. Heroes Unite! Gear-up like the AVENGERS with this new modular role play system powered by NERF! The movie-inspired STAR-LORD blaster comes with connector pieces and NERF darts so kids can build and blast like the intergalactic guardian. Kids can also create lots of blaster combinations using ASSEMBLER GEAR from other heroes (each sold separately). Includes blaster, two connectors, and three NERF darts. Available at most major retailers and on HasbroToyShop.com. Heroes Unite! Gear-up like the AVENGERS with this new modular role play system powered by NERF! The movie-inspired HULK gauntlet comes with connector pieces and NERF darts so kids can build and blast like the gamma-green hero. Kids can also create lots of blaster combinations using ASSEMBLER GEAR from other heroes (each sold separately). Includes gauntlet, three connectors, and three NERF darts. Available at most major retailers and on HasbroToyShop.com. Heroes Unite! Gear-up like the AVENGERS with this new modular role play system powered by NERF! The movie-inspired IRON SPIDER gauntlet comes with connector pieces and NERF darts so kids can build and blast like the web-slinging hero. Kids can also create lots of blaster combinations using ASSEMBLER GEAR from other heroes (each sold separately). Includes gauntlet, three connectors, and three NERF darts. Available at most major retailers and on HasbroToyShop.com. Kids can imagine wielding the powers of THOR with MARVEL’S STORMBREAKER ELECTRONIC AXE! Activate thunder and storm sound effects by pushing the button on the handle. Features movie-based design inspired by THOR’S new weapon in AVENGERS: INFINITY WAR. Requires 2 AAA batteries, included. Available at most major retailers and on HasbroToyShop.com. Kids can imagine wielding the most powerful weapon in the galaxy like THANOS with the electronic INFINITY GAUNTLET fist! Push the center button on the gauntlet to light up the Infinity Stone and activate mighty sound effects. Features movie-inspired deco designed to fit most kid hand sizes. Requires 2 AAA batteries, included. Available at most major retailers and on HasbroToyShop.com.